Posted by Unknown / On : 2:32 AM/ Thank you for visiting my small blog here. If you wanted to discuss or have the question around this article, please contact me e-mail at Gps_86@gmail.com. Due to some hardware reason LG GS290 mobile got mic trouble. This is a minor fault in LG mobile but due to this we can’t complete any call and also can’t record any voice message. For this mic solution we have to change mic from five point mic to ordinary two leg universal mic using 1k resistor and two jumpers. 2. Then pick universal mic and connect first point to default mic’s first point as shown with black line in image below. 3. Then connect second point of universal mic to fifth and last point of default mic with red line as shown in above image. 4. 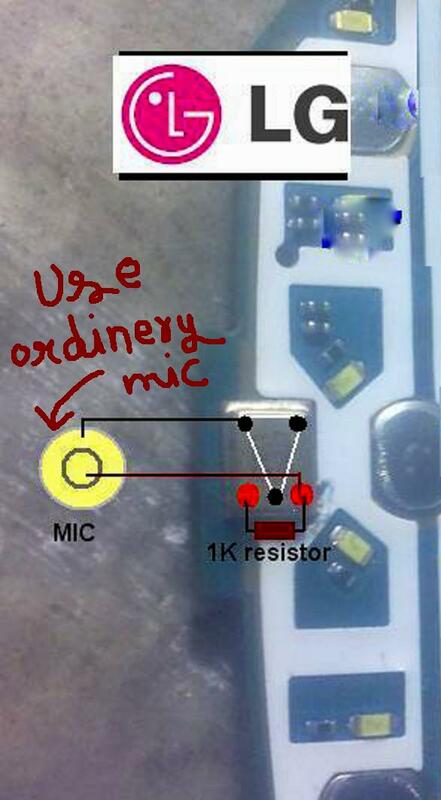 Finally connect a 1k transistor as shown with red color between 3rd and 5th point of default mic. During these mic altering process we should use good quality universal mic because local mic may result in low voice or distribution in voice during call .